What is Classic Feng Shui? Feng Shui is Chinese for wind and water, the nature science, traditional Feng Shui (American pronunciation is fung shway) states that all living things in the universe are subject to the control of the environment. In ancient Chinese geomancy, the most important concept is air. In fact, air means current or energy (Chi or Qi). It is believed that this air, if directed in a knowledgeable way, can promote harmony, prosperity, good health and long life. That's why ancient Chinese dynasties kept traditional Feng Shui methods secret, ensuring their rule for centuries. How does Classic Feng Shui work? The traditional Feng Shui practitioner/classic Feng Shui consultant calculates a building and/or a lot and does an analysis based on inside and outside elements. This information is combined with personalized data, and extensive research is performed on the unique results. Examples of traditional Feng Shui: A staircase should not face the main door; a money or people block may exist for the current year or longer; the year you were born determines the direction you sleep; and new years and circumstances affect one's environment (just as in life). There is no 'cookie-cutter' approach with geomancy, which provides personalized, scientific analysis and is traditional Feng Shui. Other methods include Black Hat, an approach developed in recent years, which uses the Ba Gua to interpret life stations. Its focus is on color, mirrors and objects. There's also intuitive Feng Shui. All have a purpose and bring value. traditional Feng Shui provides a firm foundation. Just as a house needs a good foundation to build upon, so does traditional Feng Shui. Remodeling and redecorating only go so far to change one's environment. If a poor foundation exists, the other changes are not a wise investment. The American academic community recognizes traditional Feng Shui that customizes your information per your time and space (solar and magnetic) measurements. What is traditional Feng Shui based on? Traditional Feng Shui is based on geomancy, a complete and complicated set of theories and calculations derived from I-Ching. It is a complex scientific method, rather than a metaphysical reading relying on inspiration or conjecture. Traditional Feng Shui calculates the physical reactions among the natural environmental elements, and their interaction with air currents, energy and magnetic fields. How can Classic Feng Shui help you? Would you like to experience more peace and joy? How can you attract loving and supporting relationships? What can you accomplish when financially or emotionally free? Would a more satisfying career produce more abundance? What might that career look like? Do you set goals but fall short of attaining them? Is there room for improvement with your well being, self esteem, or patience? Do you want a successful business, to expand your influence, be more generous, and make a difference? Our clients have results in all these areas and more! Schedule your no-cost 15 minute telephone consultation. What does Traditional Feng Shui accomplish? Traditional Feng Shui defines where it's most advantageous to live, how to create a beneficial environment, and how to change your work place, business, home or landscape into the best center of power for you. It is believed to provide guidance that will enable business owners and builders prosperity of their project. Home buyers make better decisions on whether or not a home is compatible with their family and goals. Homeowners and apartment dwellers can achieve harmony and prosperity within their existing environment. Why embrace Classic Feng Shui? Live a life in balance. Thousands of years ago, the Chinese began observing the many ways in which nature affected their environment. Throughout the centuries, they perfected a system of harnessing nature's power, in order to bring a sense of harmony to their living and working spaces. Today, with a desire to find balance in an increasingly fast-paced and seemingly chaotic world, there is a renewed interest in this ancient Chinese practice, known as classic Feng Shui. At the heart of classic Feng Shui is an innate understanding of how the energies of wind (feng) and water (shui) interact to create chi or life force. When chi is directed in a knowledgeable way, it promotes harmony, prosperity, good health, and long life. When chi is unbalanced it can lead to anxiety, loss, depression and illness. The practice of Feng Shui seeks to balance the forces of nature within our living and working environments, in order that we may lead a happier, healthier existence. Classic Feng Shui is more than an art. It's also a science. The practice of classic Feng Shui relies on proven mathematical principles, and the study of architecture, astronomy, design, geology and physics; as well as intangibles like astrology, philosophy and intuition. Although some consider Feng Shui to be nothing more than a glorified decorating technique, this is most definitely NOT the case; it is, instead, the original science of environmental energy. Also known as geomancy (the study of geography and lines), Feng Shui aligns the energies of a building's occupants with the energies of the structure itself. With change comes great results… The benefits of Feng Shui can be great, indeed. Often, just small changes in your environment can be life altering. Here are just a few examples of the ways Feng Shui can assist you in improving your situation. It can help improve your physical well-being. It can encourage nurturing, loving relationships. It can attract greater abundance and wealth, while helping you to reduce debt. It can improve your chances of business and career success. …but before change there must be understanding. Once you decide to improve your life with the help of classic Feng Shui, you're ready for a consultation. Every Intuitive Concepts consultation begins with a one-on-one audit, either on-site, over the telephone or by e-mail. During the audit, we'll discuss the scope of the project, making sure we understand your desires and expectations. Next, we'll work together to identify your goals and establish quantifiable objectives. Then, we'll survey the environment through a comprehensive analysis (see more below), and develop an action plan, listing the things you can do, large and small, to bring your environment into balance, and start reaping the rewards of living in harmony with your space. One analysis does not fit all. Because your ability to interact with any given environment depends on both your personal data and certain specific facts about the property, there can be no cookie-cutter approach to Feng Shui. 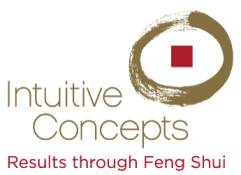 At Intuitive Concepts, we customize each classic Feng Shui analysis to your living or working environment and your particular circumstances. This customized approach also makes it difficult for us to set a one-size-fits-all consultation fee. Instead, the price of your individual consultation will depend on many factors including the size of building or acreage, whether a floor plan is provided, travel considerations, and for how many people the reading is customized. Ready to learn more? Schedule your no-cost 15 minute telephone consultation. What qualifies a traditional Feng Shui practioner /classic Feng Shui consultant? There aren't currently educational or certification requirements to practice traditional Feng Shui, unfortunately. Therefore, it's important to find a credible traditional Feng Shui practitioner/classic Feng Shui consultant. Energy fields, good or bad, should not be left to interpretation and inexperience. People often ask, "what makes a good traditional Feng Shui practitioner?" My reply: When people enter, traditional Feng Shui is felt, not seen. You experience a collaborative energy journey, not a decorating destination. Results, results, results! How are Classic Feng Shui consultations performed? Personal Analysis determines your Chinese trigram and horoscope, evaluates good and not so good directions and makes predictions for the current year (among many other things). On-site Analysis is a comprehensive consultation anywhere in the United States or abroad, and currently in the English language. A residential consult typically produces a 60+ page report. Telephone Analysis is an intensive two-hour telephone consultation and may involve e-mail, fax and U.S. mail. This conversation is recorded and sent to you. What determines the cost of a classic Feng Shui analysis? A proper diagnosis of symptoms is necessary for a successful cure. Similarly, in classic Feng Shui a correct analysis, or evaluation, is the starting point for a proper resolution. During the survey, we first observe the surrounding landscape. To do this, we observe the flow of ch'i in the landscape and ensure the building receives the most beneficial energy. Landscape design features are then suggested to be used to eliminate disturbances from inauspicious sources. Secondly, the interior is analyzed to ensure a proper flow of ch'i in every room to maximize energy flow and elemental balance. At this stage, the furniture layout is important and we recommend appropriate design features for better results. The third phase is the most critical. The ch'i components are analyzed in detail. Just as white light passing through a prism is divided into electromagnetic spectrum colors, so the flow of ch'i is divided into branches of energy vibrating at different frequencies. This process of analysis shows whether a site's energetic field is balanced using the geomancer's compass to find the magnetic pole, establish the building's orientation, and combine this information with others derived by knowing the date of construction of the building. Next, we consult on natural elemental objects and colors (belonging to missing energy frequencies that can be introduced) to recreate harmony. This analysis is applied to every room of the house to ensure total balance. The fourth phase involves compatibility of the building with its primary inhabitants. We pay more detailed attention to space and color, as well as bed and desk orientation, favoring the options most beneficial to the inhabitants. The results of such an evaluation will create detailed guidelines involving furniture layout and interior design in the case of an existing building. For new construction, design development concepts are provided for new buildings or remodeling. Share more about the types of analysis available through Intuitive Concepts. We look forward to serving you! Schedule your no-cost 15 minute telephone consultation.